Central to each piece that Karolina designs, is the idea that wearing jewellery is more than a visual experience. Touch, movement and interaction between the wearer and the jewellery are all essential aspects. What we wear can call forward hidden aspects of our personality. With this in mind, Karolina designs jewellery that seeks to evoke a feeling of confidence, strength, sensitivity, serenity or playfulness. Intricate patterns combined with striking enamels or splashes of gold to create inviting tactile surfaces. 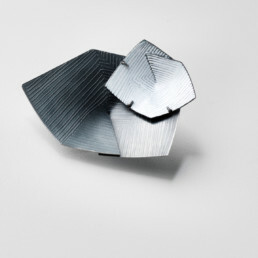 Linework and folded forms come together to enhance the bold sculptural character of the jewellery. with any ideas or queries. 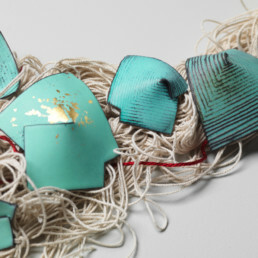 Karolina’s jewellery is caringly crafted by hand in her Edinburgh studio. Each design is deeply rooted in the sketchbook process of observation and experimentation.